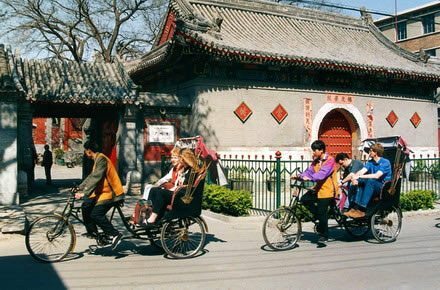 Trip highlights: Pickup from Tianjin airport, 3 days tour in Beijing, take bullet train Beijing to Tianjin, special designed activities for children and family vacations to Beijing. Upon arrival at Tianjin Binhai airport, pick up by our English speaking tour guide and drive to Beijing. Free time for the rest of the day. 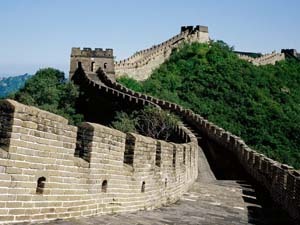 Recommend you to explore Beijing a little bit by yourself on the first evening. Tianjin Binhai Airport It is one of the major air cargo centers in China. The airport is able to handle over 500,000 tons of cargo and 200,000 flights a year. International flights are primarily operated by Korean Air and Asiana Airlines to Seoul, Nagoya, Manila and Jakarta. 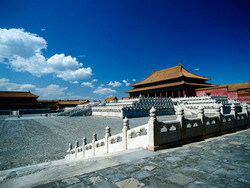 Today's sightseeings: Beijing's historic Tiananmen Square, followed by a visit to the magnificent Forbidden City. In the afternoon, you will marvel at another one of Beijing's famous landmarks, The Temple of Heaven. The highlight today is the Great Wall. The Mutianyu Great Wall is less crowded than Badaling, you might walk up and down the Wall on foot, or take cable car one way or round trips. The extra cost of cable car (RMB 50 one way) will be at your own cost. On your way back from The Great Wall, you will be driven to visit the main 2008 Beijing Olympic venues: the National Stadium (Bird's Nest) & National Aquatics Center (Water Cube). Feel free to take some photos of the stadiums. National Aquatics Centre (Water Cube) The Water Cube (National Aquatics Center) was one of the three landmark buildings of the 2008 Beijing Olympic Games. The outward appearance of the Center is a semi-transparent "cube", with "bubbles" spread out all over its surface, a shape very similar to the structure of "H2O". Olympic Stadium (Bird Nest) The National Stadium, also named the “Bird’s Nest” due to its iconic design was the key competition venue of the Beijing 2008 Olympic Games. The stadium looks like a nest from the outside, symbolizing a cradle holding the hopes of mankind for the future. [ Optional ] House of China: The owner of the house, spent US$65 million on decorating the building with his wares collected over the past two decades. The House of China is sclad with 400 million porcelain pieces, took 5 years to complete, and officially opened on Monday.